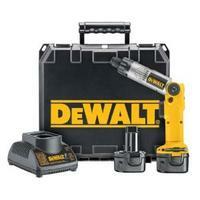 The DeWalt DW920 cordless screwdriver is ideally suited to the task of driving screws. It’s been designed for this singular function, and it does what it says on the box to an impressive degree. Way smaller and lighter than a drill, and properly balanced to be held more or less as one would a traditional screwdriver, it makes winding things in genuinely effortless. The first aspect of the DW920 cordless screwdriver that will likely attract your attention is its diminutive size. It’s powered by scaled-down 7.2-volt cousins of DeWalt’s ubiquitous tool batteries, allowing the entire tool to weigh less than just the battery pack of most comparable cordless screwdrivers. The result of all this stealth and cunning is a powered screwdriver that could probably rotate your entire house if it were called upon to do so, but which is comfortable to operate single-handedly. The impressive torque of the DW920 screwdriver is adjustable through a collar behind the device’s chuck. You can dial up sufficient twist to get whatever you’re winding irretrievably screwed in, but not enough grunt to strip the threads or splinter the woodwork of whatever lurks beyond your driver bit. While it entails a bit of practice, you can apply a considerable degree of nuance to the torque adjustment collar. The actuator button for the DW920 cordless screwdriver responds to variable finger pressure as well, allowing you to instantly adjust the speed of whatever’s turning, and further refine the degree of force with which your screws meet their destiny. The chuck has an automatic brake that engages as soon as you release the button – it will stop instantly when you’ve twisted things sufficiently. There’s a conveniently-located direction switch next to the actuator, should you be confronted with the need to dismantle stuff. The DW920 cordless screwdriver’s chuck only accepts ¼-inch hex devices – for the most part, these will be screwdriver bits, but you can get nut drivers to fit it, and, paradoxically, drill bits. While the screwdriver makes a somewhat underpowered drill for most applications, it’s handy for occasional use in this capacity. The body of the tool includes clips for whichever two bits you use most frequently, something you’re likely to appreciate if you spend any time atop a ladder or otherwise displaced from your cache of accessories. The body of the DW920 screwdriver is hinged about half way along its length. It can be locked in a vertical position or bent at about 45 degrees, causing it to resemble a battery-operated pelican with a Phillips bit in its beak. The former configuration is comfortable for working at a bench, while the latter ideally suits driving screws into vertical surfaces – a wall coming immediately to mind. The modest weight of the device makes it comfortable to hold for extended periods either way. As with the larger DeWalt battery packs, the 7.2 volt batteries that accompany the DW920 cordless screwdriver are based on nickel-cadmium technology, to provide for the maximum possible grunt for the longest possible duration. The traditional shortcomings of nickel-cadmium batteries are largely mitigated by the sneaky charger that also accompanies the screwdriver. If you leave a battery in the charger for more than four hours, the charger will massage the its inner workings, looking for weaker cells and topping them up until the entire pack is as mean and nasty as it can get. Even the case that surrounds the DW920 cordless screwdriver is unusually robust, with room for the screwdriver, its batteries and charger and enough bits and related accessories to assemble a space shuttle. The DW920 cordless screwdriver is a decidedly optional tool – you could continue to press an electric drill into service for driving screws, and just not mention the few that get stripped out due to a moment’s inattention. Your right arm will become notably more muscular than your left in time – this may entail extra attention paid to your selection of shirts. Being able to change from a drill to a screwdriver bit to a drill to a screwdriver bit to a drill to a screwdriver bit to a drill to a screwdriver bit in 0.5 seconds or less might get you some attention from your local media if it’s a singularly slow news day. Alternately, you could stop trying to shoot snipe with a cruise missile and apply screwdriver technology to screws. The DW920 cordless screwdriver is easily the best device thus created for doing so.